Manufacturer of Industrial CNC Machinery & Equipments Supply. Simultaneous complex machining with main and back spindle! 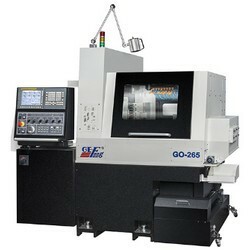 ※1 : GO-325 uses hydraulic cylinder to clamping the bar to be machined. ※2 : The required power source should be ≧19.6/20.6 KVA (GO-265/325), including extra 2KVA for bar feeder, chip conveyor, and oil mist separator…etc. ※3 : All specifications are subject to change without notice in advance.